This range of robustly built, very good quality poultry houses is practical and affordable. 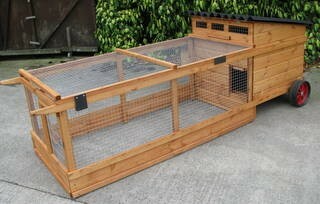 These hen houses are ideally suited to the smallhoder, pure breed fancier or garden user. These chicken coops are manufactured from softwood using deep rebate shiplap cladding and framing that is dip treated during build. All roofs are clad with "Onduline" corrugate sheet made from bitumen saturated organic fibre. These are hinged for easy access and cleaning on all units except those provided with an entrance door. Roosting bars are fitted. Access to the chicken coop for the chickens is via a pop hole with vertical sliding door. High level ventilation is provided on all units plus additional adjustable vent on larger units. All units are supplied with a solid plywood floor. 25mm square 16 guage heavy mesh is used on all runs. Finished colour - "nut brown", fixture and fittings are galvanised or plated. All units are sectional and delivered flat packed with screws provided for really easy self assembly.